Norway feeling Scottish for a day. Steall and summer highland afternoons out. 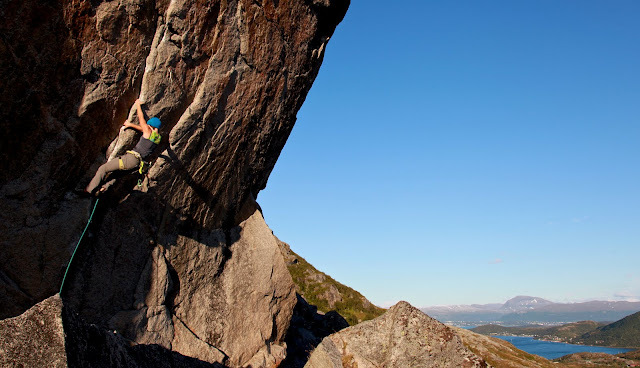 On the first free ascent of Bongo Bar, Blåmann, Norway. 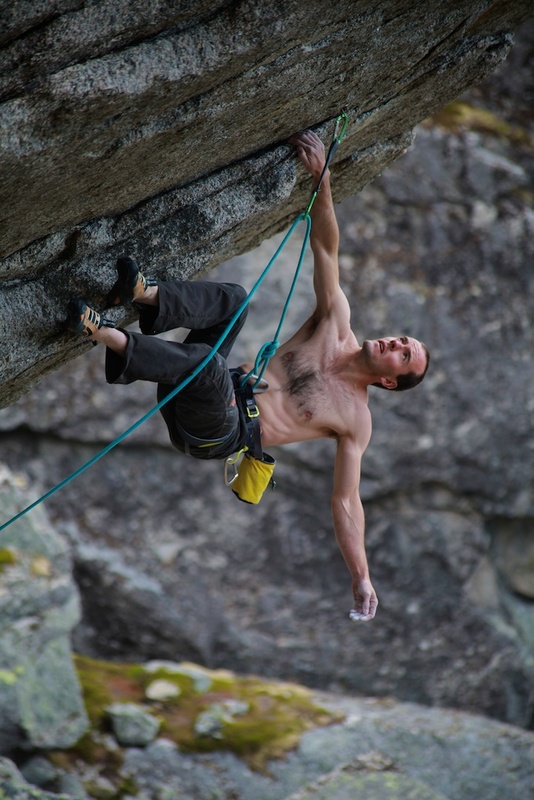 400m, 7b+, 7b+, 8a, 7c, 7b, 6c, 7a, 6b. Photo: Paul Diffley/Hot Aches Productions. 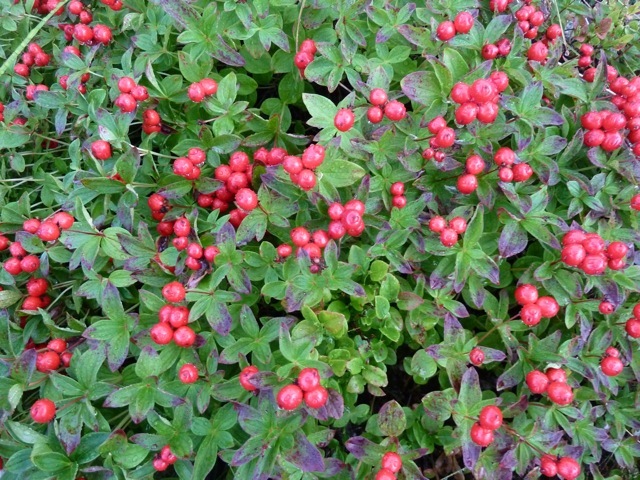 More pictures on the Gore-Tex facebook page shortly, and also on Julia's blog and Hot Aches blog. Between the three of us, we have climbed a ton of superb granite routes during our stay in Kvaloya. 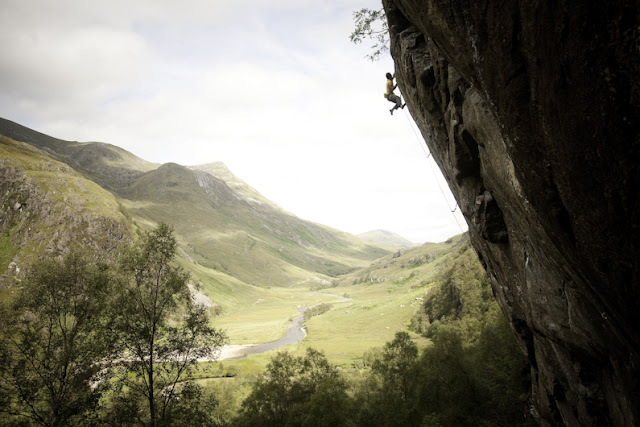 Some of the classic established routes, which are as good as anywhere in the world, and a few great new routes. But before coming here, the biggest thing in my mind that I wanted to do was a new free route on the north face of Blåmann. It’s only been in the past few years that the aid routes here have been considered as big wall objectives for free climbers. The visits by the Austrian climbers Auer and Mayr brought the wall to international attention, and it was their pictures that made me first think of coming here, followed closely by Marten Blixt's excellent guidebook. Those pictures were from their attempt to free climb the aid route Bongo Bar. They freed the first two pitches at 7b+, 7c+ (although the second is more like 7b+), but the overhanging pitch 3 through the roofs was wet and they traversed left into the ‘Atlantis’ and abseiled off to create the route 'Tingeling' (Tinkerbell in English). Their route was finished to the top of the wall this summer by locals Andreas Klarstrom and Thomas Meling (Peter Pan 400m, 7b+). 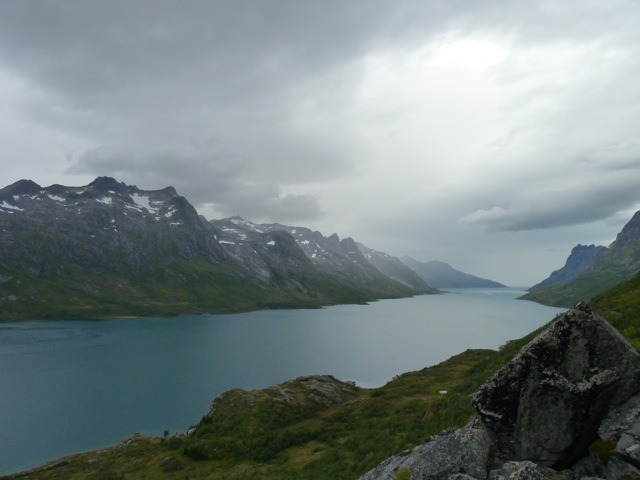 On day one of our trip, we could see Blåmann from Tromso airport, standing out from the other peaks on the skyline. When we drove round to the approach and could see the north face, I could hardly get my sack full of ropes on quick enough. But arriving under the wall, it was less clear if Bongo Bar would be possible. It looked really steep and blank through the roofs. But then again, all the other potential new lines looked rather desperate also! Lots of overhanging closed granite seams, with apparently sheer and featureless sidewalls. 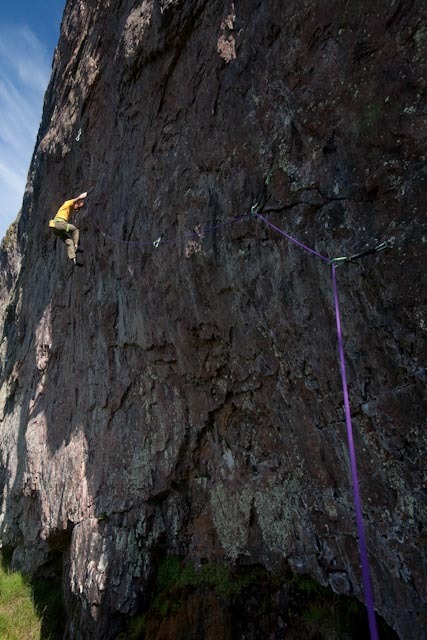 Andreas and a friend were stationed 60 metres up a new route, and were obviously having an exciting time. He was shouting down, encouraging us to look at Bongo Bar, and so I thought we should at least give it a shot. A 55m E6 6b pitch to start was a rough warm up, and a reminder that we have no steep granite laybacking to speak of in Scotland. The following pitch went rather better. 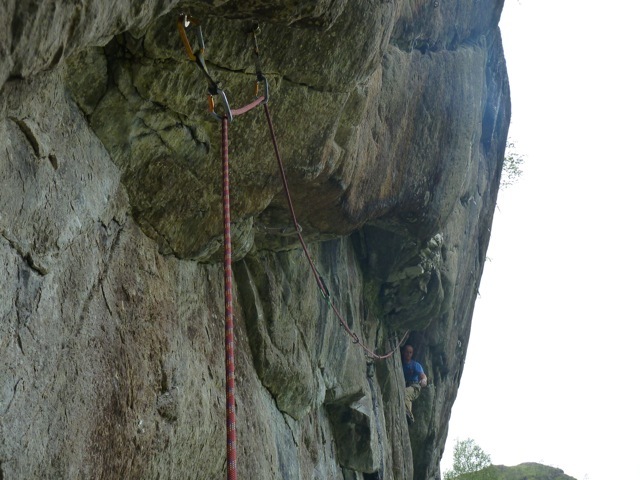 E6 6b again and the best granite pitch I have climbed anywhere. Perfect laybacking with spaced but good protection. The next day, I sent Donald onto the crux third pitch (A3) with the aiding gear. It looked hard and scary. ‘Bong, Bong, Bong’ a hollow ringing from his peg hammer came from over the first roof, followed by an exclamation; ‘Jings, Crivens and help me John Boy!’ Donald had just realised that the crack he was aiding up was actually a huge pancake flake, tottering in a groove waiting for an unsuspecting aid climber to release it from it’s perch. He was not a happy man and came down, suggesting it might be better if I delicately free climbed past it. That I did, only to find the next flake made the previous one look solid. My exclamation was less civilised. 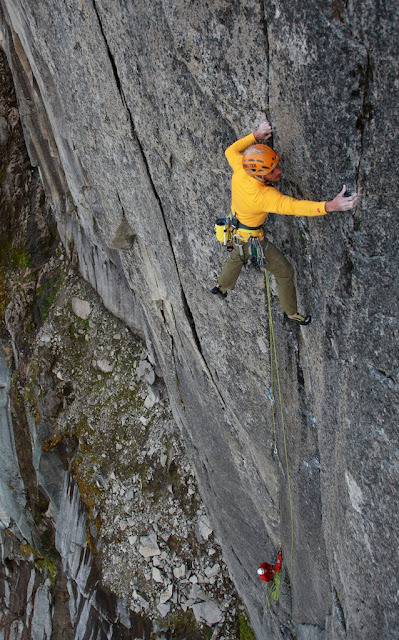 I did continue, half aiding, half free to the next belay, to find that pitch 4 looked almost as hard. After another day, I’d worked each move on pitch 3 but needed more time for pitch 4. 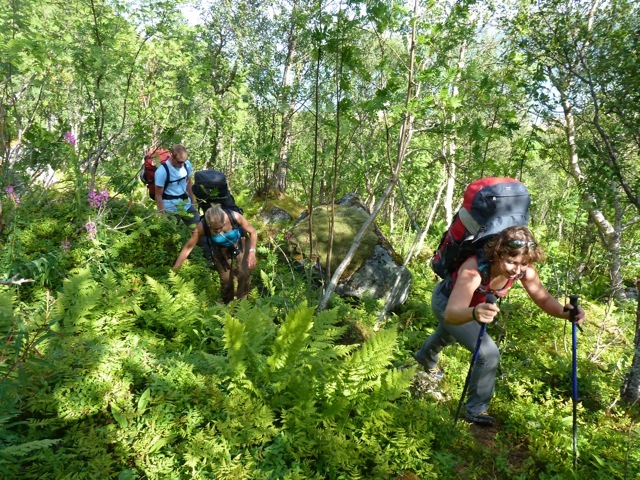 The forecast looked poor, we were unsure how to manage with logistics of a team ascent with many sharp edges about and a prospect of me doing most or all of the leading. We had a discussion on the belay and reluctantly decided to bail. However, my greatest failing is never being able to leave things like this and a few days later, I resurrected the idea of a free ascent - I would put in another day of dangling about to clean pitch 4 and scope out some of the pitches above while Helena and Julia ticked classic routes on Hollendran and then I would hopefully go for a redpoint with Julia if the weather held. Some rain threatened our chances. I walked up with Julia to find the black streaks of pitch 3 still looking dry-ish, so we started with no expectations. The two 7b+ pitches flew past and hanging on the belay 100 metres up the wall, inevitably expectations crept in to our minds. Speaking of expectations, Julia seemed to have no questions that I’d be able to dispatch the 8a (E8 6c) pitch above, and told me so in her direct but ever positive style. 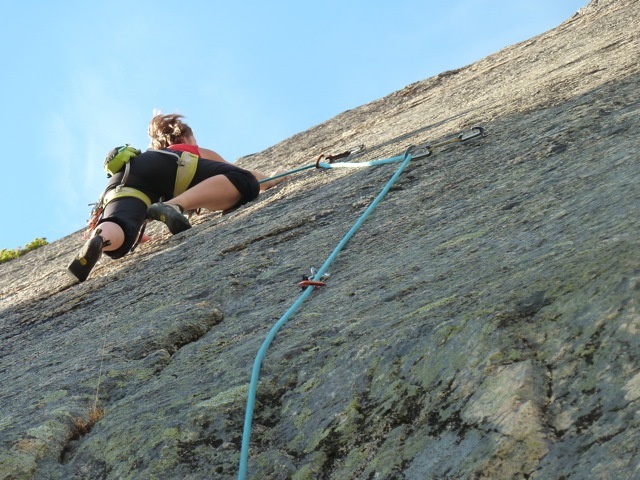 I launched up the pitch, climbing smoothly at first but wobbling into the crux and seriously losing my cool. 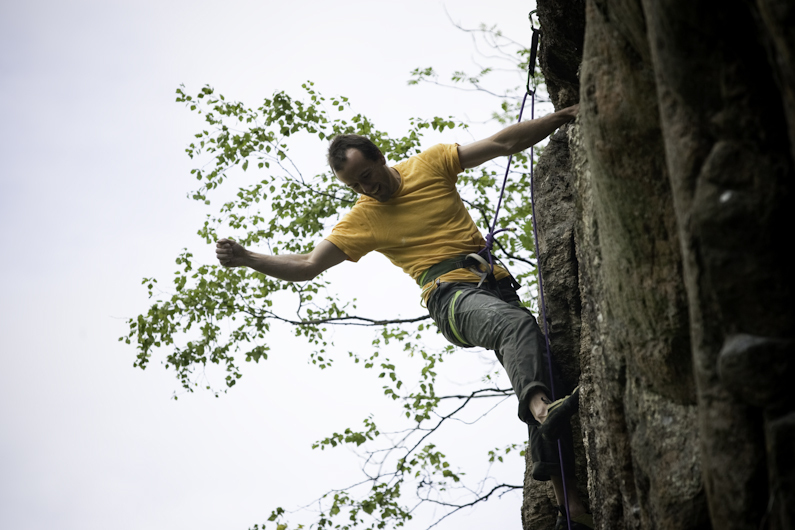 I looked behind me for the crucial thumb press; it was wet, and so was the foothold. There was no time for hesitation and as I began to slip off backwards I threw my right hand across the corner without enough time to look for the hold first. Two fingers caught it and with a grunt I stayed on and continued with ‘Elvis leg’ all the way to the ledge. 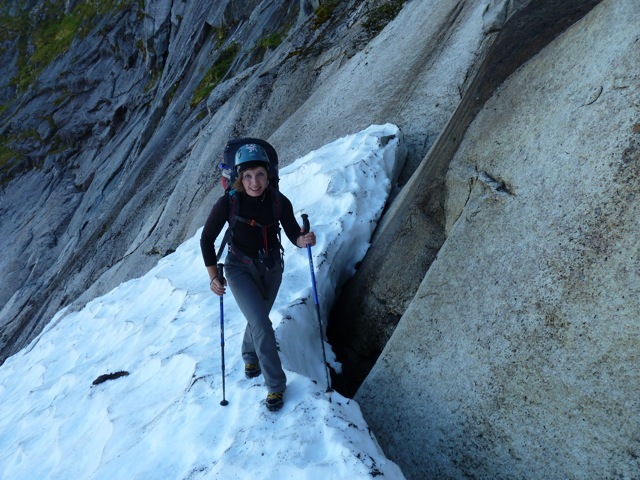 Julia’s task of seconding the pitch was going to be one of the main hurdles of the route. 8a climbing, not having been on it before, carrying a rucksack and a 45 metre diagonal pitch through roofs with razor sharp edges. Not for the faint hearted really. The rope came in steadily without a sound. Pulling on gear where she could to avoid weighting the rope and sawing it on the edges, Julia was up in 30 minutes, still smiling and directing me to dispatch the balancy 7c pitch above. After that performance, I thought I’d better. I climbed it well and in no time was swimming up layback cracks in the upper pitches. 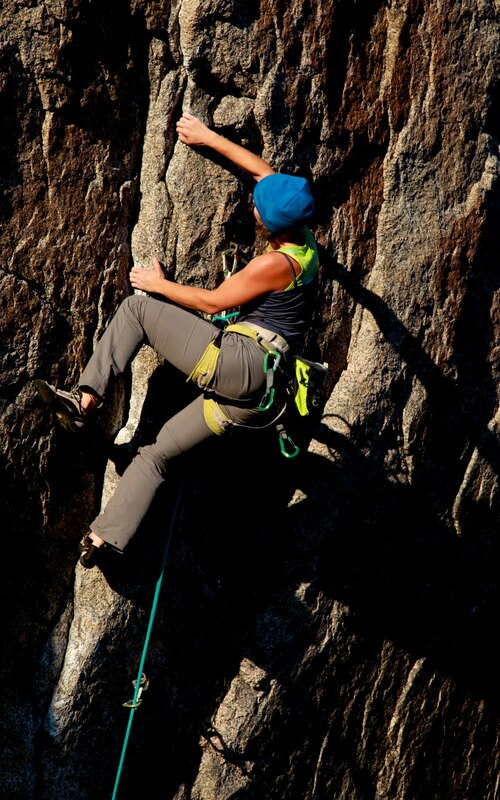 Julia was determined to go out in front and lead pitch 6. 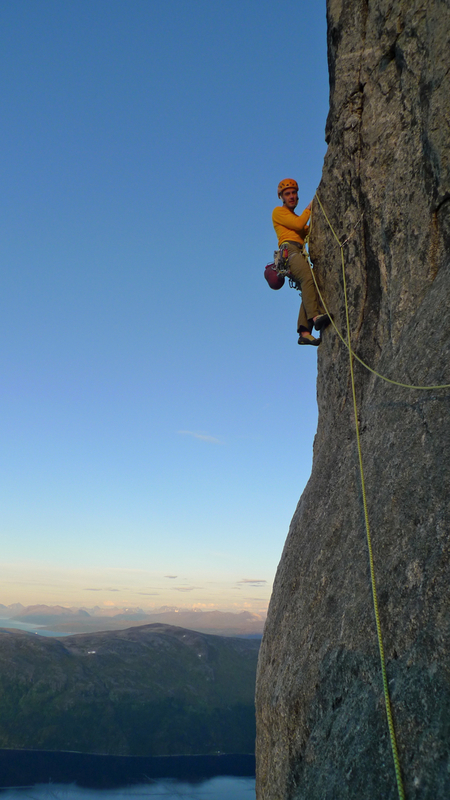 We were climbing onsight now and the pitch turned out to be 7a (E5 6a) and 60 metres long. 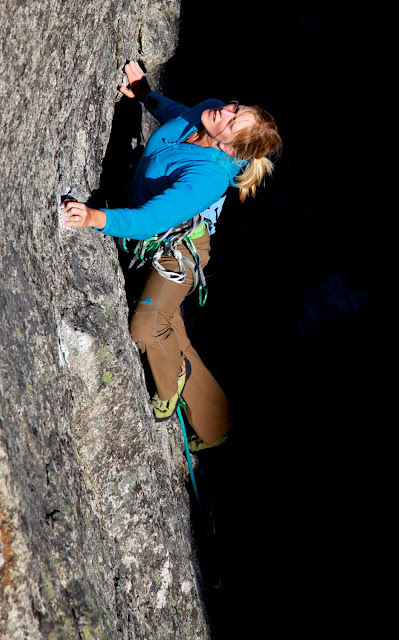 She was obviously tired from carrying our jackets, food and water on the hard pitches below but still went for it. 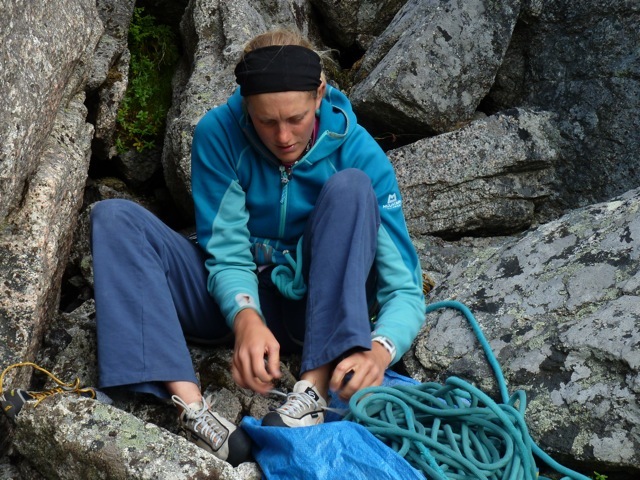 After 20 metres, she shouted that she had decided to make a belay on a slab. A good belay? She shouted yes, and then as I arrived admitted it was two old peckers from an aid ascent plus a poor cam and didn’t want to tell me before. We excavated a welcome backup cam placement and I headed around the corner and up endless cracks, now bathed in the lovely late evening sun. A BASE jumper leaped past us just before we topped out on Blåmann, and he touched down safely before we could even finish the last pitch and begin our tired stumble down for 1am pasta. Bongo Bar - the name kept reminding us 30 something brits of this song from our childhood! I have a feeling that despite the unpredictable Norwegian climate, Blåmann will be one of the most famous walls in Europe for hard granite big wall climbs in the coming years. 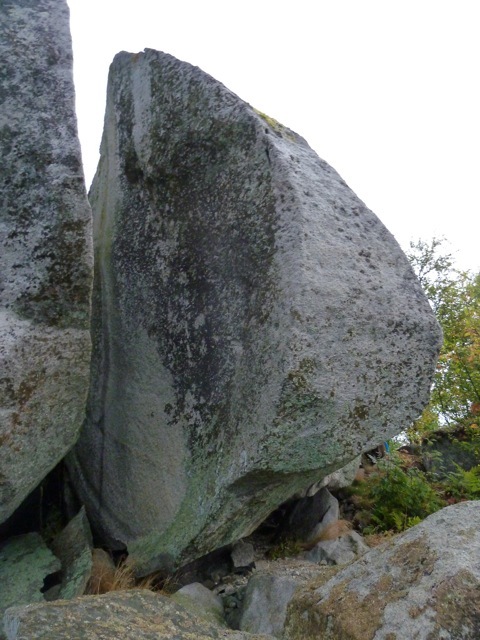 It’s a very accessible place and yet really impressive with some of the best granite you’ll find anywhere. Thanks to the Gore-Tex experience tour for sending myself, Helena, Julia, Donald and Paul on the trip, and to all the locals who helped us with information and encouragement. It was a pleasure. Here is a taster from Paul's film of Bongo Bar. Paul Diffley and I spent an afternoon boulder hopping around the crags in Ersfjord, making this little film of running and a bit of impromptu soloing. Excellent fun. My body is still sore from a long day out on Blamman. We are back off up there today to collect ropes and things as our trip is almost over. The past couple of days have been fantastic though. 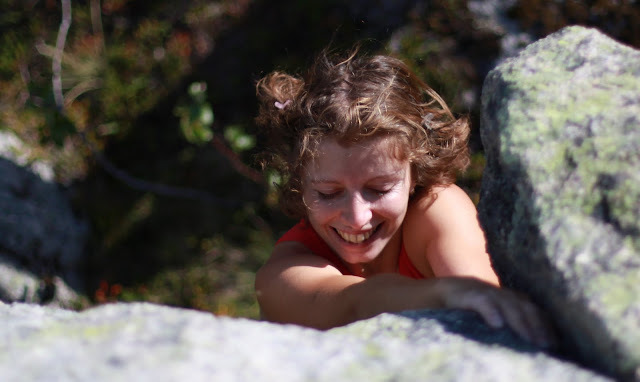 Here is a wee video of Helena doing a victory jump off the Tunga boulder. More vids are on the way. 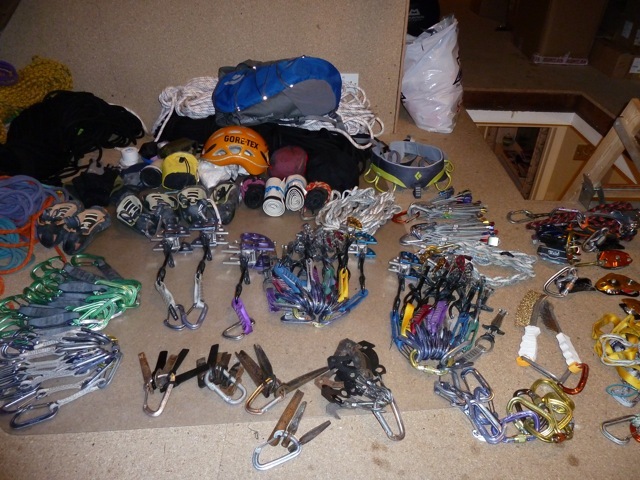 For now, I have to go and pack and head out for another long day climbing. Excellent. Yesterday was dreich here, and only one (wet) problem got climbed in great style campusing up wet slopers, muddy boots dangling behind. Great boulder though! To be honest, an enforced rest is exactly what I needed. Skin was seriously lacking on my fingertips and I’m sure I’ll be on good form for a nice route after some muscle rest time too. Today more boulder hopping and exploring while the crags slowly dry out. 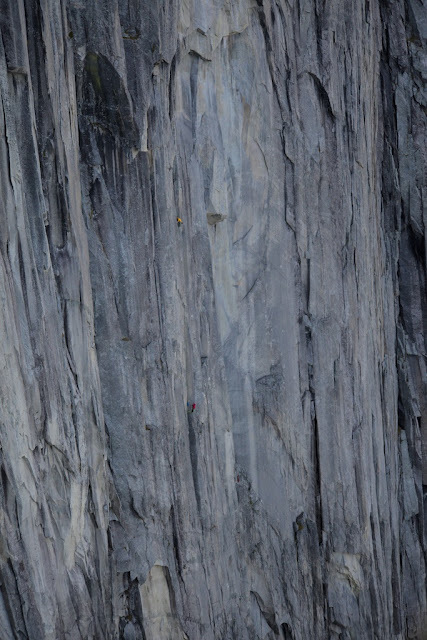 Centre Court 8b/+ first ascent, Tunga, Ersfjord. Gore-Tex jacket keeping the finishing hold dry until Donald pulled it away at the last moment. 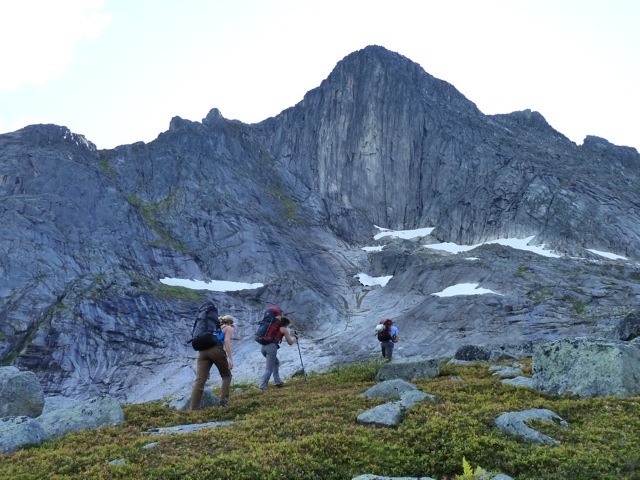 More pics on the Gore-Tex Experience Tour page here. 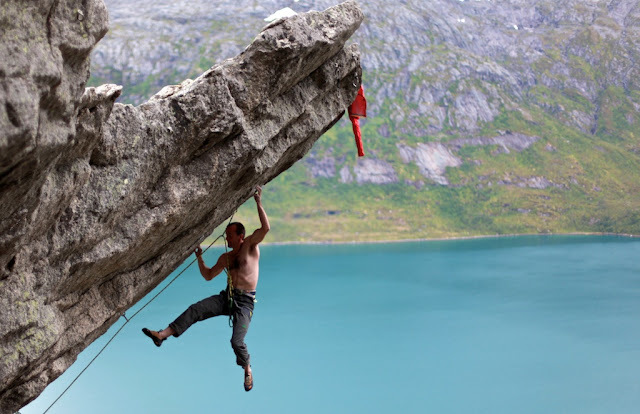 When jumping around the huge boulderfield at Ersfjord, one boulder stood out and had me clambering straight for it and uncoiling my rope. 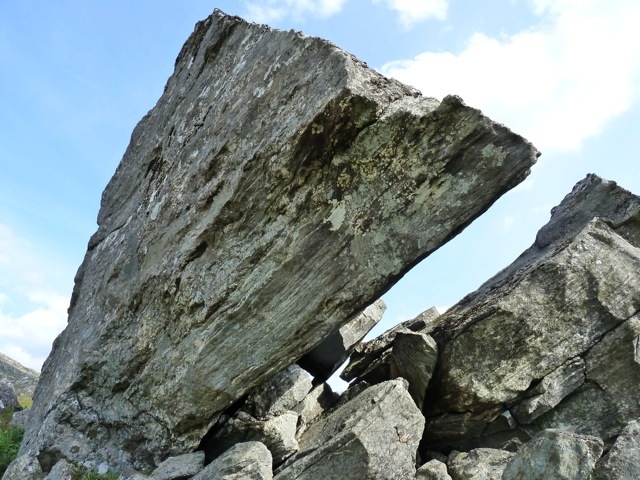 Tunga is a huge leaning fin of granite. 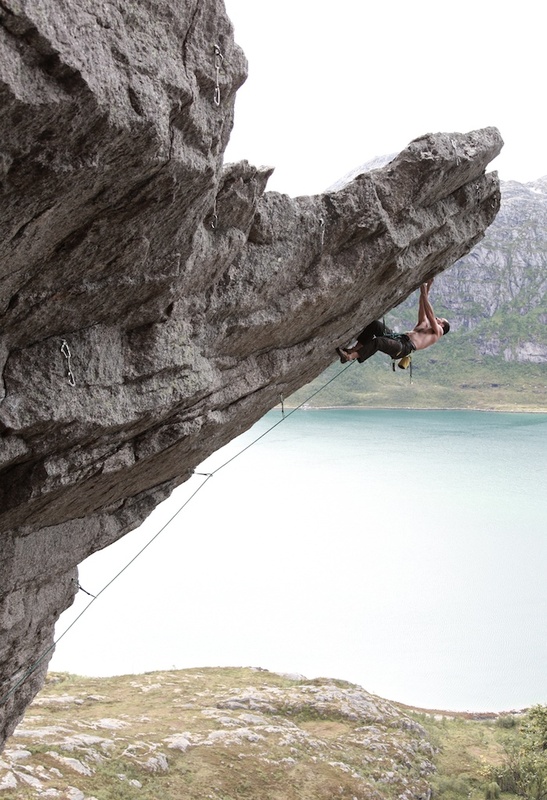 Currently home to the route Piercing (8b+ and currently the hardest route in northern Norway). I spotted a nice looking line leading across the wall into the upper half of Piercing and taking in it’s crux, so I got that bolted up straight away. I was hoping it would be a wee bit harder than Piercing, but in the end it’s about the same difficulty. There was only enough fingertip skin for 2 quick tries and then I was worried about split tips. So last night I returned but it was still so hot and humid I initially decided not to climb at all. A whiff of breeze changed my mind, and it was just as well I succeeded first try since my fingers would not have stood another attempt. I can’t decide if its 8b or 8b+ (same goes for Piercing) so it has a split grade. Maybe if it wasn’t so humid it would have felt easier. I spent the rest of the session trying another line I bolted, 8b+/c or 8c+ depending on the chosen finish. I doubt I’ll have time to finish it before we leave, but I’ll have a go! 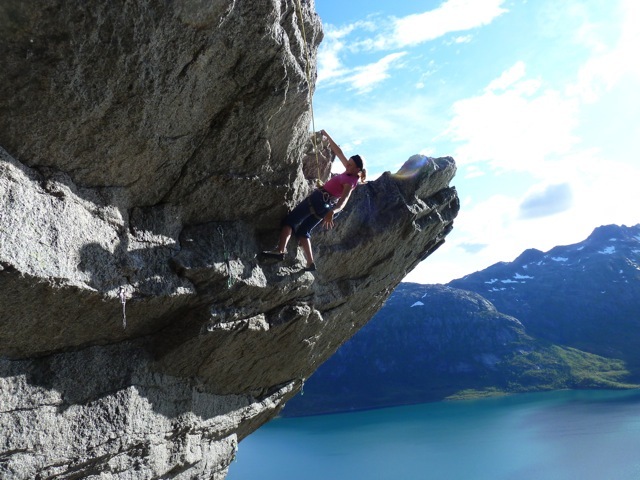 Two nice videos below by Paul Diffley of Helena and Julia climbing in Ersfjord and Gulknausen. Yesterday, Donald and Helena went for a big ridge traverse run over Blamman and the chain of mountains beyond. Meanwhile I spent more time cleaning and trying moves on new routes. 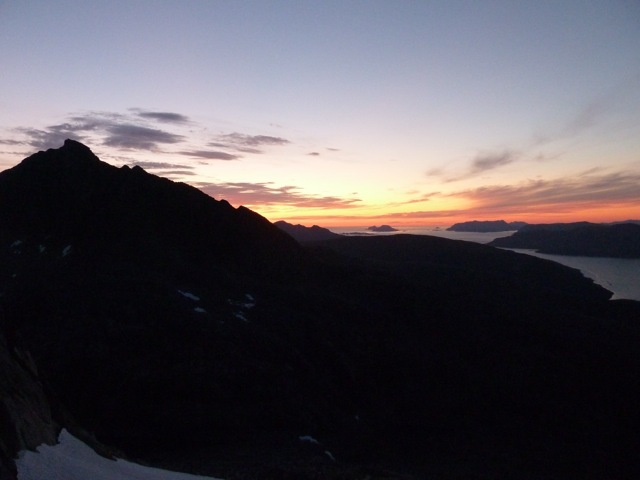 Right now we are waiting for the cool of the evening (plus dilligently cultivating fingertip skin) so we have half a chance of holding small holds in the roofs of Ersfjord. Paul is sitting beside me editing another video, which will be on the Gore-Tex facebook page at some point soon. A little rain sweeps across Ersfjord. It didn’t last. Helena getting ready and climbing Turistklasse - a lovely traverse out above the space below. 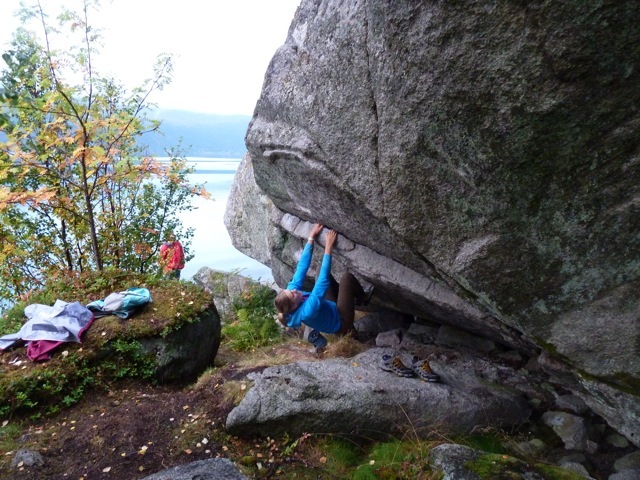 Everyone’s fingertips are really suffering now at the hands of the unforgiving Ersfjord granite. Even after a rest our tips were still pink and small holds feel unpleasant to pull on. However, we went for it anyway. 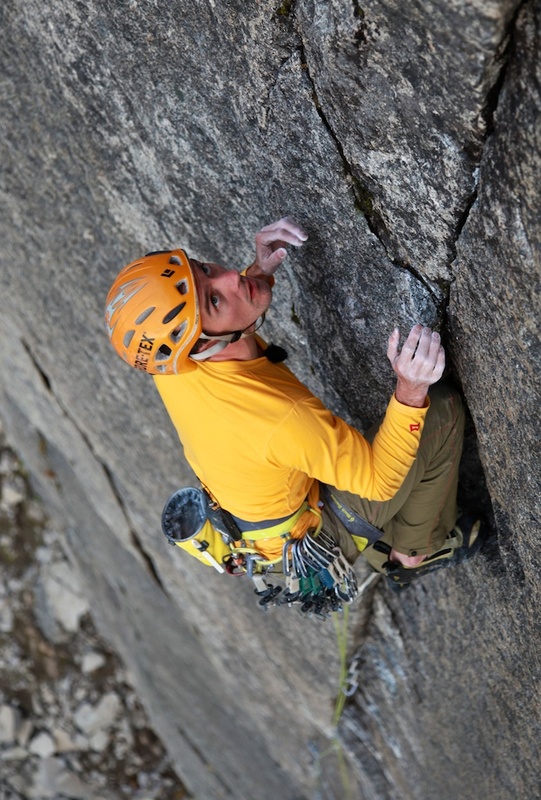 I bolted a superb line on a massive roof after two tries I was ready for a redpoint try, all except my fingers. Down to the last layer before a trip ruining split tip, I had to stop until tomorrow morning. Afterwards I bolted two more new routes and belayed Julia while she bolted another. So between us we have made some progress on quite a few different projects, and the forecast is still nice. 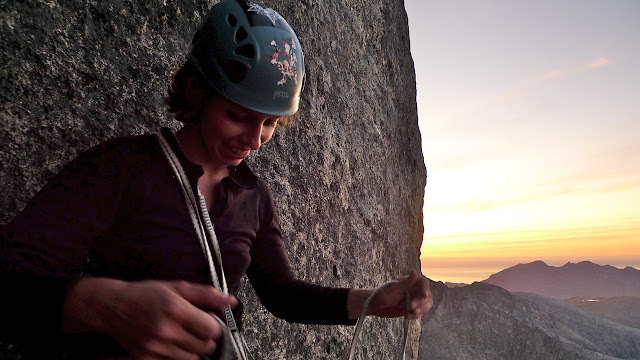 Diff has made a lovely video of Julia climbing one of the island’s best 7b+s over on the Gore-Tex experience tour facebook page here. 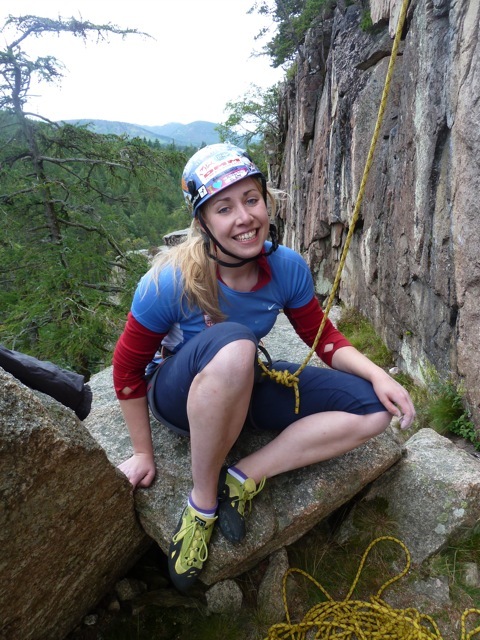 Julia exploring granite boulders, Blammanen. All pics by Paul Diffley/Hot Aches. 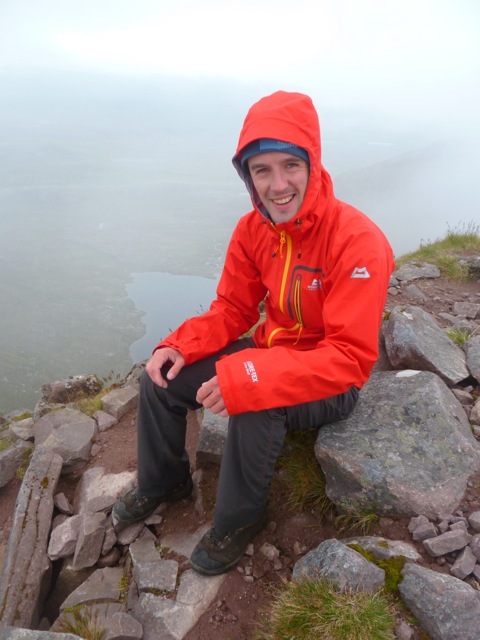 Paul's uploaded a nice gallery of pics to the Gore-Tex facebook page. 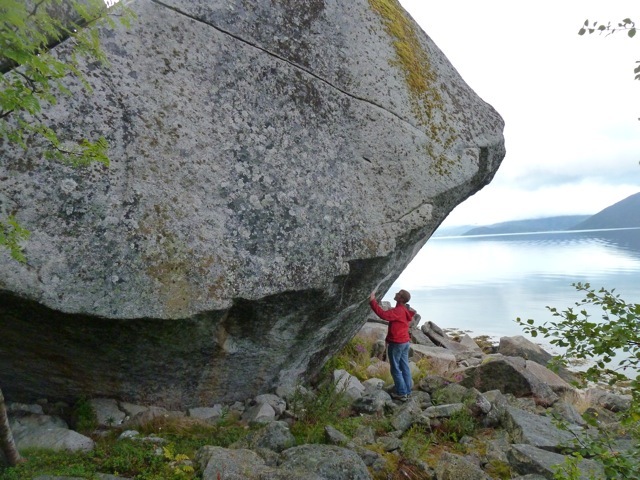 Today we are resting sore fingers from the Ersfjord granite in Norway, for a morning at least. 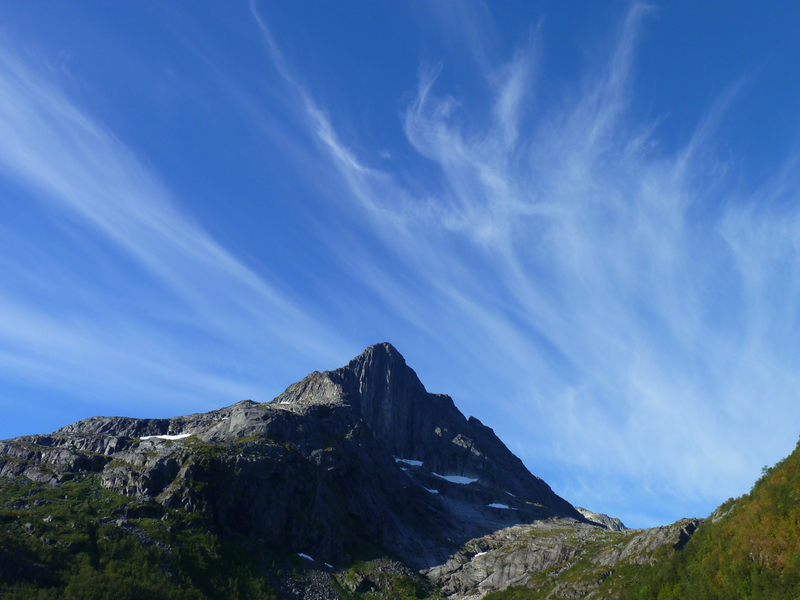 Later, I’m off for a proper explore of the faces and boulders above Ersfjord itself. Things have been going up and down here over the past 2 days, as is normal for the business of looking for hard new routes. We were doing well on a route on Blammanen and I was getting most excited. But some logistical problems made us realise it would be difficult to do it safely in the time we have here. So yesterday we went to another venue. Straight away I saw a great line to start working on, and after a couple of hours on it, had done the moves. It’s a 70 metre pitch and a difficult crux after 30 metres. I think it’ll take a little time, and some better conditions. I’ve never been great at climbing granite, since there isn’t much steep granite in Scotland. But I’ve definitely learnt a lot in the past 4 days, and I’m eager to put it to good use. Last night was quite hard work as it was unexpectedly hot and humid. Not what I was expecting from this trip I must say. A lot of skin was lost from the team’s fingertips. Tomorrow, maybe we look at somewhere different again. I think all of us are getting into the flow of the climbing here. 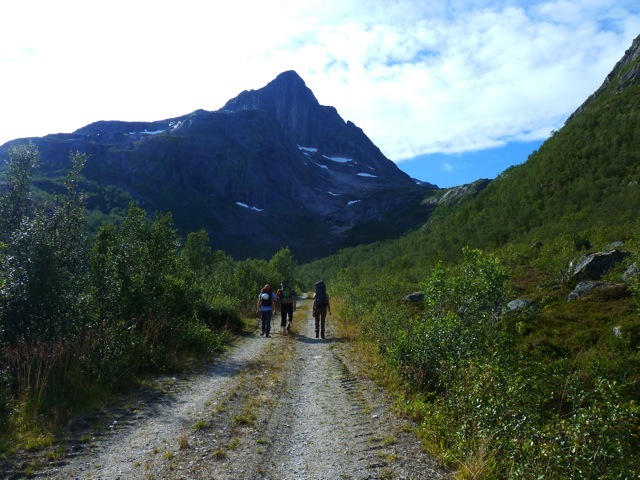 I write quickly before we go back into the mountains for more climbing in Norway. Yesterday, we did our start of trip faff, buying food etc and drove round for an evening session on Blammanen. We managed to choose a line to try and did 2 50 metre pitches of E6 6b. The next pitch looks extremely hard and blank, going through roofs. But if that goes, the rest of the route should too. Time to send Donald out in front with the aid gear! That is the project for the next two days at least. I was feeling a little daunted at the prospect of doing it all again today after finally making dinner at 2am after climbing yesterday. but Helena’s pancakes this morning have squashed this feeling a little. The belay in sight at the end of Maxwell’s Demon 8b+, Steall during the first ascent. Pic by Steven Gordon. Steven has uploaded a nice gallery from the day on his site here. It’s not so often I get to the chain on two sport projects at Steall in one day, never mind two first ascents. Finally a break the humidity allowed me to get some redpoints in. 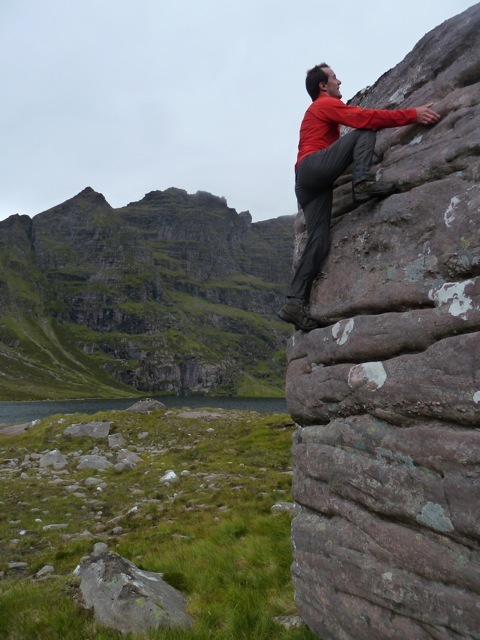 First off, I took an interest in an old project climbing straight through the central cave, taking in the crux of Arcadia and breaking out onto the headwall to join the finish of Ring of Steall. Duncan McCallum had first tried the line in the nineties but abandoned it and it was de-bolted after some unnatural holds briefly appeared (and were filled in very well). 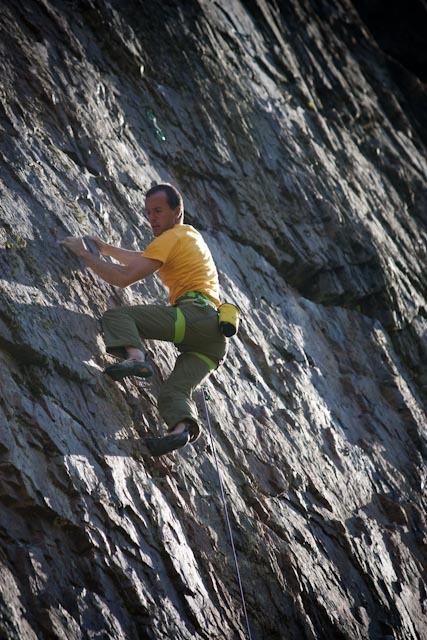 I re-equipped the start and finish (the middle bit takes in a couple of trad placements on the Arcadia crack) but it was always either too cold or seeping or I had a crap sequence. Anyway, the other day I managed to do it and thought it was excellent. I had originally thought it was 8b but after a bit of a scrap for a few attempts even in dry conditions it felt a bit more like 8b+. Next up I went straight onto an excellent link-up possibility that Michael first pointed out to me. Climbing pretty much all of The Fat Groove (8a), across the lip of the roof of Maxwell’s Demon, reversing the crux traverse of Arcadia and finishing up most of Leopold (8a) to give a 40 metre diagonal stamina monster. Michael’s proposed that if it would go it would be a ‘5 star mega classic’. I can confirm that’s pretty much how it climbed. It takes in a lot of cruxes of 8as and harder, but with some good, if body pumping rests. 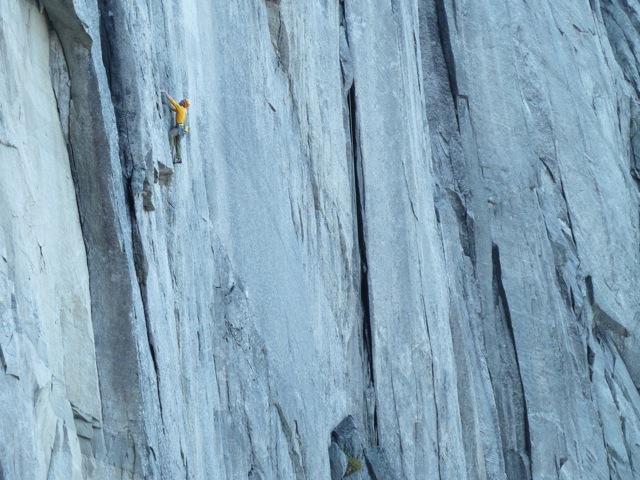 I called this one Steallworker (8b). What a nice way to round off a couple of weeks climbing at home before I leave tomorrow for the Gore-Tex Experience Tour trip to Norway. Throw in another kneebar and press on! Halfway along the big link-up on Steallworker 8b during the first ascent. Yesterday the weirdest thing happened to me. I’d already been to A&E at the Belford for an X-ray of my left foot since it was still feeling extremely painful if I weighted the medial side of my foot on the Sesamoid with my big toe pulled up. It was feeling like something was definitely wrong. It was getting worse every day. The X-ray returned a negative for broken bones but just a comment that I had the weirdest feet they had ever seen. But still no explanation for the very targeted pain, except that it ‘must’ be a bruised bone. I was unconvinced. Movement was fine with great care not to stand on the medial side of my foot, so I kept a date to go for a big run with Peter. 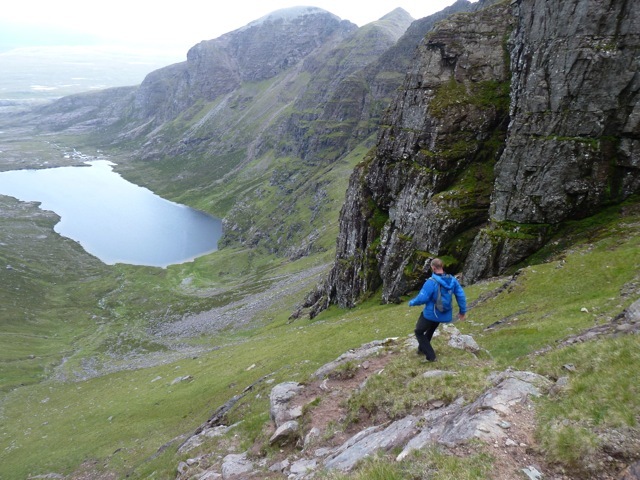 In the circumstances scaled it down to a short run and not even really a run and so headed for An Teallach. 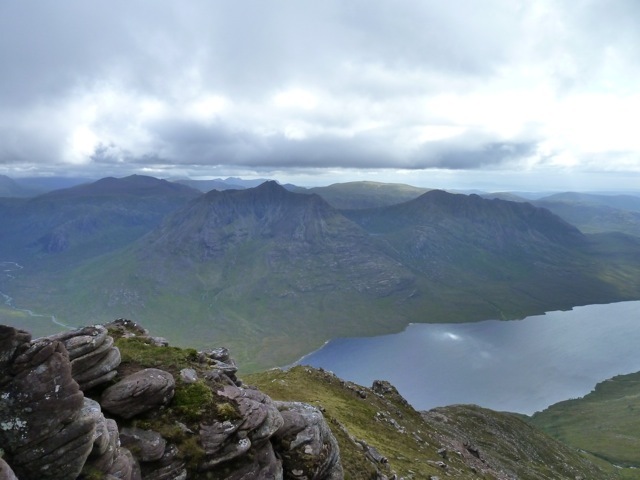 We set off after 3pm and slogging up Sail Mor, my foot was seriously complaining. The whole way I was contemplating a bail request, but just kept my head down for ‘another 50 metres’ all the way to the summit ridge. Once there, I stopped to put on my jacket and started walking again. WHAT???!!! No pain!!! All of a sudden, it stopped hurting and I went from mild hobbling to bounding along the ridge crest in normal hill running stylee. So, the explanation seems to be a dislocated (subluxed) sesamoid that spontaneously popped back into it’s groove. Very strange experience. 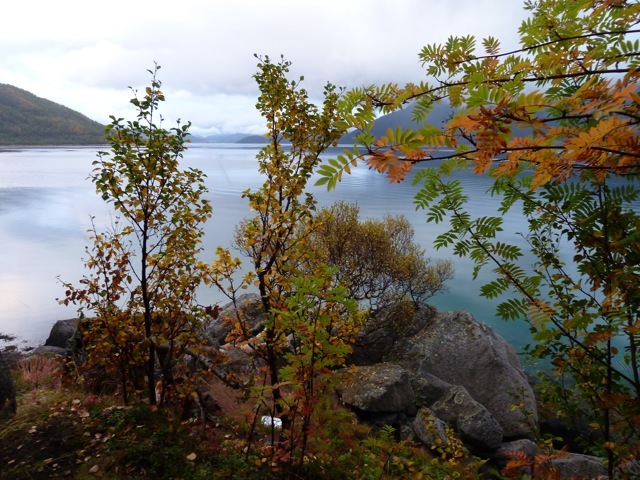 Loch Quoich, Knoydart. I took Freida for a walk at Kinlochourn. It was a lovely afternoon. I had a great but hard couple of days up there with Rich and Michael working hard on projects in fairly rubbish conditions. I now have three nice projects wired and ‘overlapping halves’ on all of them. All we need now is a fresh northwesterly and a couple of rest days for some exciting redpoints. Always love Steall sessions. The moves are super technical, sometimes downright weird, sometimes downright brutal, always pumpy as hell. Anyone fancy a session there next week? Steven attaches big lenses to shoot the Gore-Tex ad in the Coe. 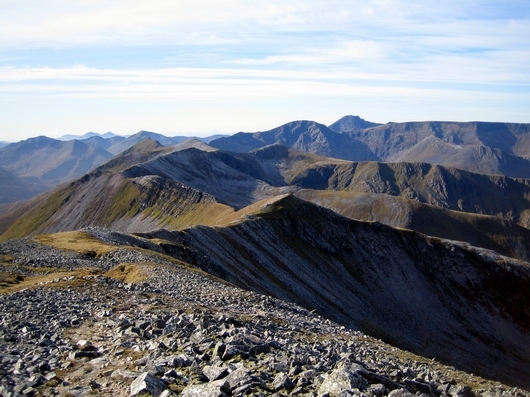 Stob Coire behind. Unclimbed roadside boulder, Knoydart. The prow looks like a V8 or so. 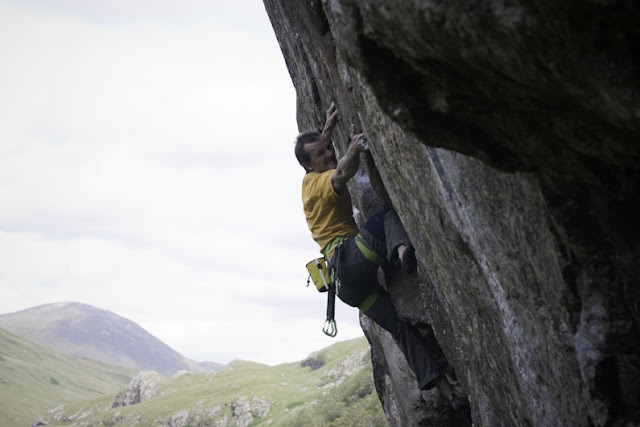 Alan Cassidy - Metalcore 8c+ from Matt Pycroft on Vimeo. Lovely video by Matt Pycroft of Alan Cassidy’s repeat of a route of mine called Metalcore (8c+) at the Anvil. Excellent effort. The other day after baby group I went for a wee run. With the Experience Tour trip to Norway just over a week away I am needed to sharpen up and shed a pound or two quickly after having put in a few weeks of training. So after a 12 hour fast Claire dropped me off in Glen Nevis and I headed up over Meall Cumhann, across the empty Coire Giubhsachan and up that savage slope of Aonach Beag (via a wee scope about the crags of course). I was still feeling bouncy of leg after that but as I headed out across the Grey Corries I began to notice the knuckle under my left big toe getting progressively sorer after an awkward landing on a stone. Sgurr Chionnich’s Beag and Mor passed ok although running was kind of off the cards by then as the fuel switched almost exclusively to lipid. On the way up Stob Coire Nan Easain I very quickly felt like a lie down. My body was giving me a message. It emphatically did not want to ascend any more without sugar. 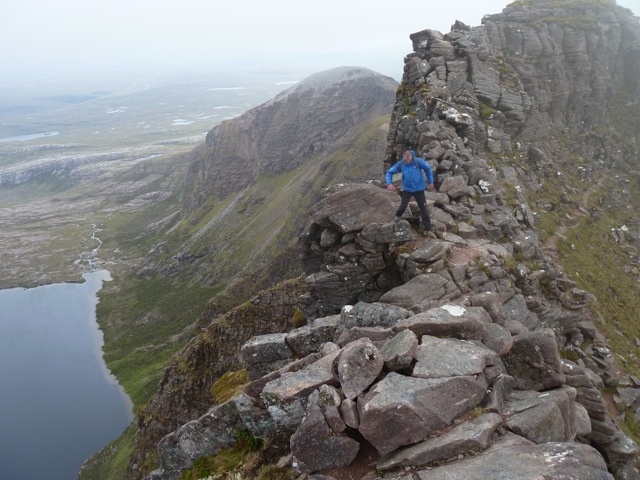 It was hard to bail when after Easain it’s a steady cruise without much more ascent, but it’s been a while since I’ve ran so I took the chilled option and stumbled down into the massive and wild Coire nan Eoin. Despite feeling pretty lousy, the solitude of this glen was something else and I tramped quite happily in my own little zone through it’s meanders out into Leanachan Forest. 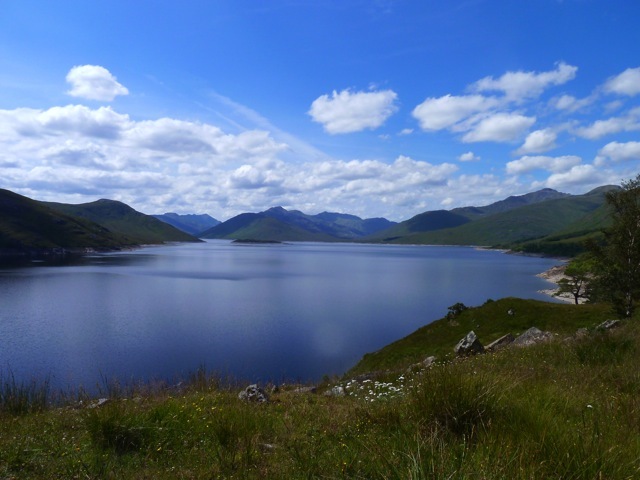 However, once in Leanachan Forest, I was really ready for some dinner let me tell you so it was a fine training exercise to tramp through it’s seemingly endless tracks leading here, there and everywhere and finally back to my car in Spean Bridge. I had a pound coin in my car. It’s been a couple of decades since I’ve done this but I dived straight into the Spar shop and stood carefully in the sweetie isle calculating how I could buy the maximum amount of chocolate for 1 pound. I couldn’t believe chocolate bars are 70 odd pence these days! My prizes lasted well under a minute (1 picnic bar, one fudge, 11p change). Good day out. Might do this again next week. 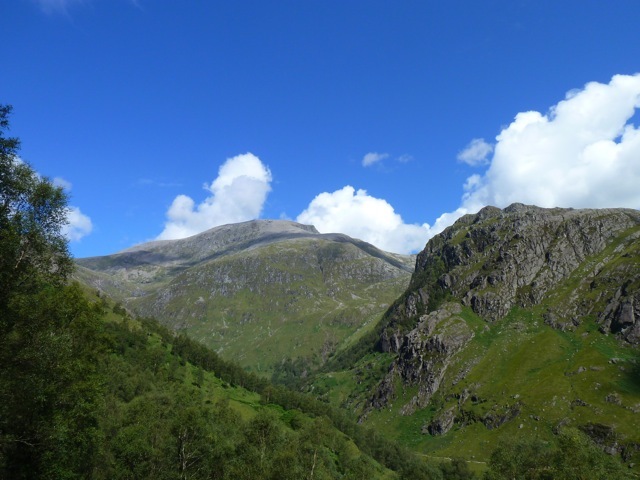 Tomorrow feeding midges as Steall again. Vector Space 7c+, Tunnel Wall. Pics by Steven Gordon. The past couple of weeks have flown by, doing work for Mountain Equipment, Gore-Tex and the John Muir Trust among others, and grabbing climbing days in between. First off I nipped up to Tunnel Wall with Steven Gordon after work and climbed an excellent new line I bolted a couple of months ago. It’s the obvious diagonal overlap running across the wall from Uncertain Emotions to eventually finish up the top half of my own route Axiom (which was upgraded to 8a, although I must say I still think 7c+ is correct). A few people had talked about equipping it and it was well worth it. The new line ‘Vector Space’ seems to miss out all the tricky Tunnel Wall cruxes of the straight up lines, so it climbs really smoothly and worked out pretty steady even though it’s 40 odd metres long. Ben from Kate Owen on Vimeo. 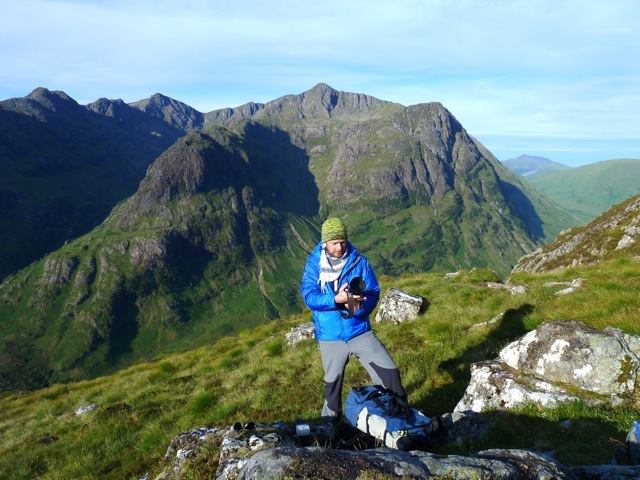 Nice video by Kate Owen about Ben Nevis. 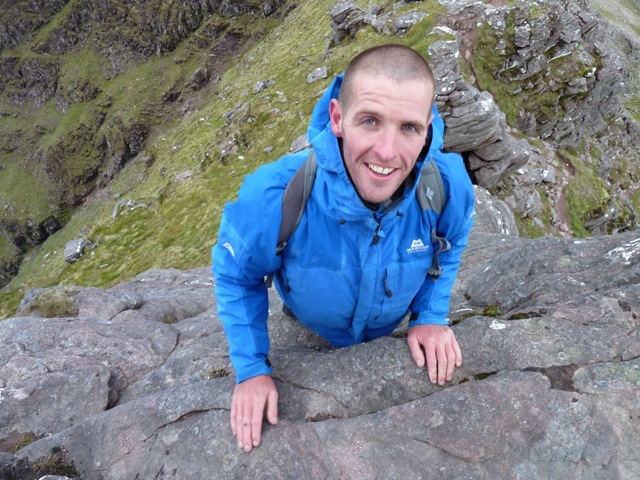 The climbing by me is on the Heather Hat boulder and Kev’s section is on Scimitar Ridge. I particularly liked the hill running part.